Not to be confused with Catchy Tunes. Info "Brrrrrrzzzzt... turn the... brrrrrzzzztttt... radio... bzzzt... dial to... bzzzzzttttt... tune in!" 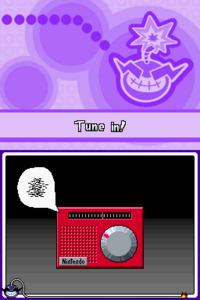 Catch a Tune is a microgame found in WarioWare: Touched! in the Slightly Unscrewed stage. The objective is to turn the radio dial so the radio sound can be heard properly. This game has twice the time to complete as other microgames. 1st level difficulty: The radio is a portable radio. It will be very easy to tune in. 2nd level difficulty: The radio is a stationary radio. It will be harder to tune in. 3rd level difficulty: The radio is a wooden radio. It will be even harder to tune in. The song being played on the radio is the first line of Mike's theme song. This page was last edited on November 28, 2018, at 02:02.